Meticulous care with the lathe - meticulous - and so I was only four thou out when I'd finished making the bearing housings. Four thou for heaven's sake! Again! Heigh ho, so what's new? I'm a rubbish machinist. But I own scissors, and Coke cans are to be had from the wayside. Neatly shimmed, the bearings sort of fit, after a fashion. The frame angle is a Lowing Joint which is my favourite. 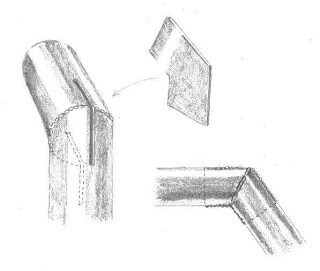 The Lowing Joint is named after Dr Lowing who, in a series of complicated emails from the far side of the world, told me how to do this partic'lar weld which he calls a 'Double-D Joint'. When I finally understood I was so impressed that I renamed it, and the Lowing Joint it has now become in the great lexicon of recumbenteers, along with tadpole, which I rather disapprove of, and sitzhöhe, which I like. The rear axle got welded to a sleeve clamp so I can vary the wheelbase, and the vile handlebar got itself off that BMX which started the whole project off. No other handlebar would allow knee clearance, and I certainly wasn't about to waste time making one. I had thought - being realistic - we would now have a completely ludicrous machine for riding round and round the house at a variety of speeds on varying numbers of wheels, destroying the lawn and various boy's (sic.) trousers. But the surprise was how much there was to learn from it. When the wheelbase is long the trike isn't very stable, but is rideable. With a short wheelbase the weight is on the back wheels so the front wheel spins like a drag racer. But oddly enough, you don't immediately feel you need a wider range of gears. Your psyche seems to say, 'Ho, 26er, eh? I'm happy with that,' and you trundle along at double walking speed on the dirt roads of the orchard. But you soon realise the need both for a brake, and for footpegs for when you've wound it up to speed and don't want your knees to buzz like a Japanese motorcycle. And it has the remarkable sophistication of a reverse gear. And if you forget to tighten the clamps on the back axle it's a lean-steer trike. 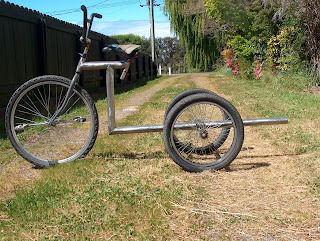 - Well, a lean-wobble trike. Immediately, of course, thoughts of miniature penny farthings are provoked, either with a 29er front wheel which I can afford, or a 36er which I can't. 36er unicycles are to be had in New Zealand; I saw someone riding through the middle of no-where on one with a huge rucksack on his back. But Mr English, notified of the experiment, immediately discovered that 36er penny farthings are being made in Taiwan http://www.taiyingsystems.com/penny_farthing.php so now I fancy making a penny penny, which means a mountain bike wheel on the back too. Since this would be a FWD MTB fixie I imagine all the locals will get very enthusiastic about it. Or not. As the case may be. 1. Johnnie Johnson was Britain's highest scoring fighter ace of WWII. He shot down my wife's mother's fiancée. Probably.